Gaza City - Tens of thousands of Gazans gathered at the Israeli border on Saturday to mark a year since protests and clashes erupted there, testing a fragile truce only 10 days ahead of an Israeli general election. A 17-year-old Palestinian was killed by Israeli occupation regime troops east of Gaza City, the Gazan health ministry said, while 59 were wounded, including 13 from live fire. Earlier, another Palestinian was killed by Israeli regime in an overnight demonstration ahead of the main protest, the ministry said. Egypt had sought to mediate between Israel and Hamas to rein in violence and avoid the sort of deadly response from the Israeli occupation army that has accompanied past protests. Clashes so far appeared limited, but warnings to stay far back from the heavily fortified fence that marks the border were not being heeded by all. “We will move towards the borders even if we die,” said Yousuf Ziyada, 21, his face painted in the colours of the Palestinian flag. Dozens of Palestinians were seen approaching the border fence east of Jabalia in the northern Gaza Strip at around midday before retreating as occupation troops fired tear gas. The protesters threw stones at the occupation soldiers and burnt tyres. Further south, an Egyptian security delegation visited a protest site east of Gaza City. Hamas leader Esmail Haniya also visited the site. The city’s mosques used loudspeakers to call on people to attend, and buses shuttled protesters to sites in rainy weather. Senior Hamas official Bassem Naim called Saturday’s protest “a very important message sent from Gaza today to all parties, mainly the Israelis and the international community”. “Gazans today are gathering here, thousands and thousands of people peacefully, to raise their voice against aggression and the imposed siege on Gaza,” he told AFP. 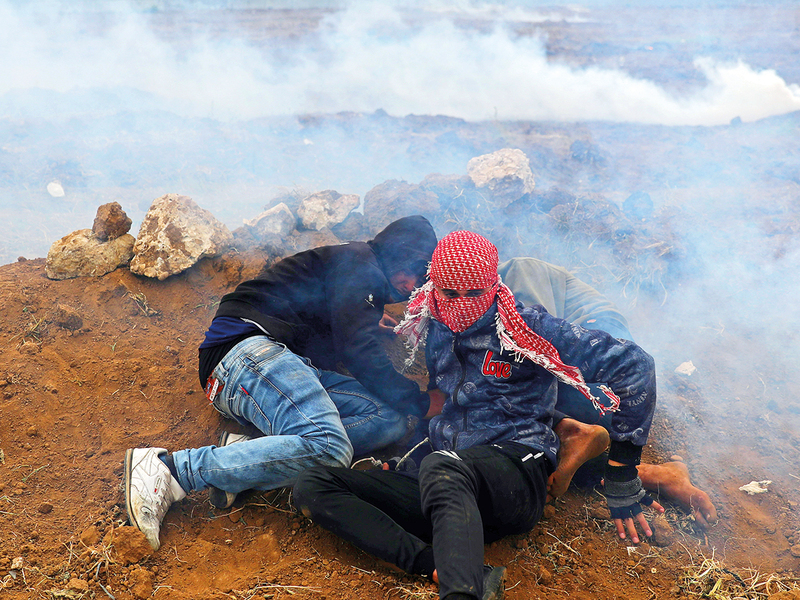 Protesters were marking the first anniversary of often violent weekly demonstrations in which more than 200 Palestinians and an Israeli occupation soldier have been killed. The anniversary comes only days after another severe flare-up of violence between Israel and Hamas. An Egyptian-brokered ceasefire restored calm. The demonstrators are calling for Palestinians to be allowed to return to land their families fled or were expelled from during the 1948 war that accompanied Israel’s creation. Last month, a UN probe said Israeli soldiers had intentionally fired on civilians in what could constitute war crimes. The UN says more than 90 per cent of Gaza’s water is unsafe for drinking and residents receive less than 12 hours of mains electricity a day.